To be quite frank, most of the year is selfish knitting for me. I rarely make gifts or things for other people, although grandkids has had an impact on that reality. I do, however, knit with the yarn store in mind. Most of the things I finish (which is far less than I start) end up as samples in my shop. Sure, I get to play with some pretty awesome string. But when I stumble across a yarn that isn’t available to retail, I do feel guilty knitting with it. So that’s my selfish knitting – unapologetic about plying with yarn that’s not from my shop. January started with a pair of fingerless mitts. 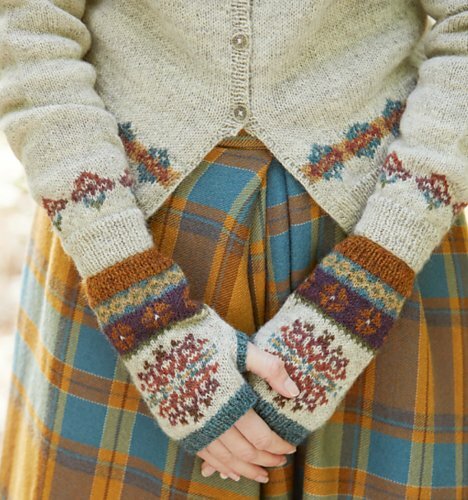 Beautiful colorwork, and a pattern that is only available when you buy the yarn - the Glen Fingerless Mittens. And the yarn is unique as well. 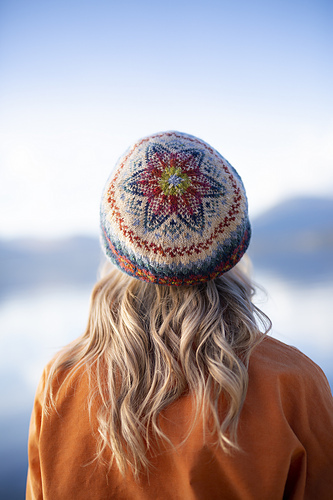 From Marie Wallin in England, it came along with a box of 12 skeins, each a different color. Only for sale through her website. Spun in Devon, it’s a blend of BFL, Exmoor, Wensleydale and Zwartbles sheep breeds. Yummy! A really fun balance between soft and grabby (a necessary element for stranded colorwork), with a little bit of fuzzy and a substantial dose of barn smell. My favorite part of wool – I love to bury my nose in a sleeve, close my eyes and imagine I’m surrounded by hay and farm animals. So much fun to work with something new and different, I actually finished the pair in a week! Once those little cuties were finished and blocked, I moved on to a new hat. One of the lovely designs from Kate Davies’ newest book, Milarrochy Heids. Like Marie, Kate also has her own line of yarn that’s only sold through her website. And because I can’t resist yarn (anyone else have that problem? ), I ordered a couple of her kits. Mostly to compare colors, although it’d be a shame to not knit with it (which means two hats rather than one will likely spring from my needles). I’ve found close color substitutes of both Jamieson’s of Shetland Spindrift and Baa Ram Ewe’s Pip Colourwork yarns – both from across the pond, like Kate’s yarn, but also available at For Yarn’s Sake. Not as selfish as my fingerless mittens, but still something that’ll grace my head rather than a hat stand at the store. And isn’t the mere act of knitting (whilst the laundry piles up and the dishes remain crusted with last night’s dinner) somewhat selfish? In a very good way, though. Thank you January for giving us all permission to turn inward and do something totally selfish rather than selfless. I love selfish knitting month!